Recognised efficacy in preventing and treating diarrhoea. Broad spectrum efficacy (acne, burns, colds, depression, gingivitis, cramps, ulcers). Zinc, a major mineral, plays a part in almost all the body's cellular and enzymatic processes. Its bioavailability and digestive assimilation increases significantly when bound to orotic acid. An essential component of over 80 enzymes, it plays a role in all metabolism and has a specific antioxidant, anti-free radical action. Other ingredients: silicon dioxide, magnesium stearate, maltodextrin. 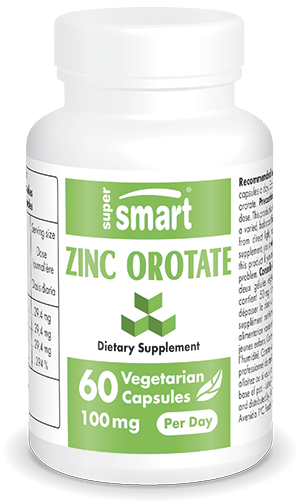 Each vegetarian capsule contains 50 mg zinc orotate.